My grandmother (abuelita) Catalina Maria Ortiz Acosta's parents were born in New Mexico. She made chili sauce in the New Mexican style, a sauce of mostly puréed, dried chilies with spices. This sauce is the backbone of many Hispanic dishes. Catalina was an artist who believed that anything worth knowing came at a price, and this sauce was her specialty. She was in her seventies before she would give me this recipe. In exchange for the recipe she insisted I wash every downstairs window of her house. While I scrubbed and polished, she sat in the backyard patio of her home in Playa del Rey, California, by the sea near Los Angeles threading a ristra of chilies from a new box of chili peppers that had arrived from New Mexico. After finishing a few windows I’d stop to visit with her and she’d tell me a little bit more about her recipe. It was certainly worth the effort. If the sauce is too picante (hot), you can cut the heat by adding a can of stewed tomatoes or a thick tomato sauce to the blender. This suggestion would have been frowned upon by my abuelita who insisted that a proper chili sauce never included tomatoes. Nonetheless, if the mildest chilies are too hot for your taste, this method works. My abuelita’s original recipe used to take hours when prepared with a food mill. I’ve adjusted the chili sauce recipe for quick and easy preparation. 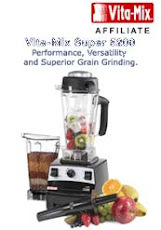 Use a powerful blender such as a Vita-Mix for best results. Tools: 1 ½ qt. or larger saucepan with lid. Powerful blender. Stove top. 3 oz net wt. package of dried chilies: Use Chili California OR New Mexican OR Pasilla OR experiment with mixing varieties. 3 cups water or broth. Rinse the dried chilies briefly to dust them off. Put them in the sauce pan with the water, garlic and onion. Bring to a boil then cover and simmer for 15-20 minutes. In the blender put the cumin, salt and cocoa powder. Add the hot chili mixture including the water. Put the lid on the blender and slowly “step-up” the speed of the blender from low to high. (Never start a hot mixture on high as it may explode out of the top of the blender.) Process the mixture on high for approx. 3 minutes or until very smooth. This versatile sauce is ready to serve. It freezes beautifully. Use it over tamale pie, as an enchilada sauce, base for chili soups or over fried eggs and omelets. It's the key ingredient to Carne Adovada, a traditional New Mexican pot roast slow cooked in the red chili sauce. Experiment with the sauce by adding ingredients such as: wine, dried fruits such as raisins, apricots, plums, ground toasted nuts or seeds (about ½ cup) , sweet chocolate and cinnamon. Note: for a thicker sauce, add a few more chilies or decrease water a little. Webby Awards nominated the COLOURlovers website for their prestigious Best Community Website of the Year award for the second year in a row. If you think about color, you're going to love this website. Register and you can post your own colors. I haven't begun to do more than lurk on the COLOURlovers site and read the great blogs and other entries. I'll let you know when I do more. In my spare time I've been putting together a PDF Color Consulting brochure booklet to explain my color consulting process to people interested in hiring me to do either on-site or remote (via email and phone), color consulting appointments. Until that's done you can see my color consulting portfolio on my website. When that's done, I have some ideas for paintings I need to winnow down into a solid concept. Creating a painting is always an interesting process. 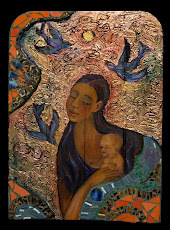 I start dreaming about the pieces, then the images become so forceful that I paint them. This isn't true for all images. Mostly it's the case when I've been doing a lot of non-visual creative work (like writing) and my brain needs a long dose of non-verbal time. Community Colors - The Ripple Effect. Habitat for Humanity Silver Lake Blvd. Success isn't always immediately obvious. 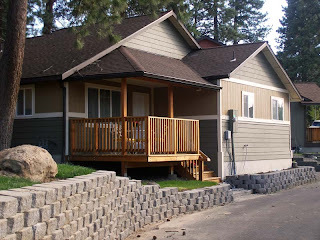 I worked on a project a few years ago in Bend, Oregon that has proven to be very successful. I am sharing the result because I believe that each one of us can have a positive impact on our global community with actions that at the time may not create a big splash. Fitting affordable housing into an upscale neighborhood is a difficult task in cities where property prices have outpaced wages, a situation that has happened in my town. 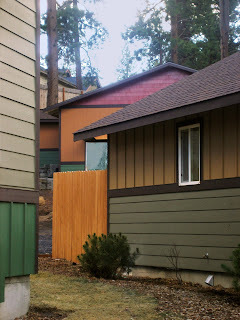 Meeting this challenge in the city of Bend, Oregon, Habitat for Humanity developed the neighborhood hamlet of Silver Lake. They planned ten homes to integrate into an existing upscale neighborhood. Building small homes that would coordinate (rather than match) the surrounding Craftsman/Arts & Craft style inspired neighborhood, Habitat planned for Craftsman details to be added to the Silver Lake homes. Reading about this plan I realized that despite the addition of woodsy front porches and trim, if all of the Silver Lake homes were painted the white and tan tones of the then usual Bend Habitat home, the vision of a lovely hamlet would fade into a cluster of mini track homes. Calling Habitat, I got permission to approach a national paint company for a donation (this project was too big to rely on one local store for generosity). Benjamin Moore & Company said yes to my proposal and generously supplied free paint to the Silver Lake project for both the exterior and interior of the ten homes! This gift was valued at approximately $20,000.00 dollars! The local dealer for Benjamin Moore paints, Standard Paint & Abbey Carpet worked with the Bend branch of Habitat for Humanity to make the donation a success. I developed a palette of exterior paint colors that the neighborhood invested into their covenants and restrictions. Clients could choose any paint colors they wanted from that exterior color palette. Habitat clients, most of whom had never chosen their own house paint colors were ecstatic! I guided them in the paint color choosing process if they requested my support. 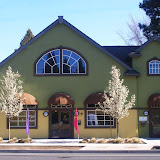 The Silver Lake project was so successful, that it won a local community award, the 2005 Bend Beautification Award. The city saw that Habitat’s concept worked, which led to two more Habitat neighborhood projects of ten homes each. I am very proud to be part of this project. It nurtured the seed of the idea to integrate affordable housing within a community into a successful reality. Thank you Bend Habitat for Humanity and Benjamin Moore! 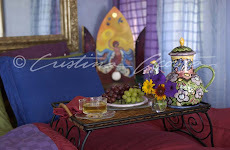 See more of my color consulting work on my Project Portfolio website page. Ancient and contemporary wisdom intertwine in the magazine Pure Inspiration. Robert Becker, the Editor and Publisher of the magazine weaves reader's stories among a selection of articles that inform and inspire. 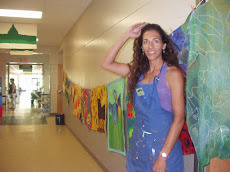 "Cristina Acosta discusses her experience as a painter, pointing out that "art" is more than just a particular activity: "Time and maturity have revealed to me that all humans are artists, whatever our medium may be. Our canvas is time and our palettes of colors are the choices we make." She emphasizes that for her, art is more a process than an end to be attained: "I keep painting, each stroke of my brush a record of the present moment. When the painting is done, my involvement with that set of moments in time is over. The images are now for the viewers. They will discover their own meanings." Read this article when you purchase a copy of Pure Inspiration. Read more about my books and articles on my site. You'll find a list of home decor, personal essays and writing about art. Hello, we are about to install Wicanders cork in our living room. I researched flooring off/on for 3 years and kept coming back to cork but was never happy with the urethane finish until I found Wicanders WRT finish. Question, I noticed you have cork on your stairs. How long has it been installed? How is it holding up? How did the installer match up the noses on the tread to the cork tiles? 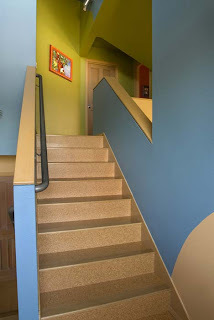 I really want to expand cork up our stairs. My flooring contractor is willing to experiment, but if he could contact your flooring contractor and 'talk shop', it would be most helpful. Any information you're willing to share would be really helpful. 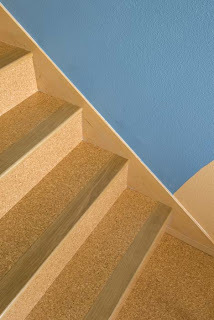 Wicanders Cork Oak with the WRT finish is holding up beautifully on our stairs. We had the Cork Oak put down throughout the entire house (except for Marmoleum in the bathrooms) about one-and-a-half years ago. The installer nailed the floating plank pieces directly to the riser and tread. An artisan woodworker, Terry Scoville made bull-nose trim pieces in white oak to match the trim in the rest of our 20 yea r old home. Before the bull-nose trim pieces where nailed to the treads, I stained them with a watery artist acrylic I mixed (to mimic the existing stain) then coated them in Benjamin Moore's Benwood Stays Clear acrylic floor sealer (satin finish). We do wear our shoes in the house and our traffic patterns are tight. Nonetheless, the Wicander's Cork Oak has held up beautifully. I highly recommend the flooring. In the early 1920's my grandmother Catalina Maria Ortiz Acosta and her family, living in Los Angeles, befriended Charles O. Roos and his wife, Jaunita E. Roos. The family connection was certainly enriched by Catalina's friendship and professional relationship with Jaunita. Catalina (1904-1991) was then a twenty year old classical pianist and the featured pianist at concerts the Roos organized. My grandmother spoke with admiration regarding Juanita's musical abilities. Charles, an Easterner, moved to Los Angeles and worked as a newspaper feature writer when not involved with his work as a lyricist. His wife Juanita was a gifted pianist. They collaborated to create a variety of piano compositions. Charles also wrote poems and lyrics for other composers' music. The concert program for the event at the Ramona Convent in Alhambra, California illustrates the typical concert Roos organized. Nordskog Records recorded the concert. Unfortunately, I don't have a copy of that recording or know of it's existence. Sifting through my Grandmother's photo albums I found several photos of Charles and Juanita. The photos of the people in the Native American outfits are my grandmother Catalina, and Chief Yowlache, dressed in traditional Native American Indianclothing for publicity photos that Roos used in his concert promotions. Chief Yowlache was the "Indian baritone" for the program. Catalina accompanied him and also played solos. During a time of escalating social injustice, Juanita and Charles Roos were creating musical compositions that celebrated different cultures. Though women had only just received the vote, and womens rights were often negated, Charles Roos publicly acknowledged his wife Juanita's contributions, including her name on compositions they collaborated on. The concert program at the Alhambra Convent School illustrates that the Roos were actively promoting the beauties of the Native American Indian and Hispanic culture to the elite of the dominant Anglo society. Understanding the political climate within which my grandmother was making her musical contributions to culture increases my admiration for her artistry and strength. She steadfastly dedicated herself to excellence in her art form and understood the symbolic importance of her image as a intelligent and accomplished Hispanic woman when many minds were closed to the idea of such a person existing. I searched the internet for more information about the Roos and found an interesting essay. I've included an excerpt with a link back to the original author. You'll recognize the name "Lieurance" in the Composer/Lyricist column of the concert program. I've also included some links to historical documents that record the political culture of the era. The following excerpt sheds light on Roos connection to like minded Anglo intellectuals during this time. "His (Lieurance's) interest in tribal music began in 1902 with a visit to his brother who was an Indian Agent on the Crow Reservation in Montana. From that time he began a life-long fascination with the music and customs of the Native Americans. He visited over 30 reservations and amassed a collection of several thousand recordings and transcriptions as well as a large number of Indian flutes. He also invited Native Americans to his studio in Lincoln for some of the recording sessions. It was often difficult to coerce the Indians into performing for his recording machine, but his understanding and patience with tribal ways won them over. He had an enormous respect for the people and had learned a great deal from the Native American wives of two of his brothers. Much of his vast collection now resides in the Smithsonian Institution, the New Mexico Museum, and the Archive of Folk Culture at the Library of Congress. Lieurance drew upon Native American melodies for many of his own compositions which he then clothed in what he called the "harmonizing which our ears demand'. His most famous piece is "By the Waters of Minnetonka". It was first published in 1913, and became the number one sheet music hit of its day, with many subsequent published arrangements. It was performed and recorded by some of the leading musicians of the era and enjoyed world-wide popularity. Photos: copyright 2008, Cristina Acosta. Photo of single woman, Catalina Ortiz Acosta in the 1920's. Photo of Charles O. Roos and his wife Juanita Roos (inscribed to my grandmother, Catalina Maria Ortiz Acosta). Photo of Charles O. Roos with a paddle. Connections between people are more obvious than ever before in history. Virtual-world relationships on sites like Facebook and LinkedIn are blurring the external boundaries between our work, social and family selves. The boundaries between the different worlds we pass through during the course of our day and the different personas we may inhabit are now permeable. How do we keep centered, balanced and creative when the world around us is increasingly changeable? Keeping the connections between eyes, hands and heart open requires practice. Meditation is one of the tools I use to keep the connections open within myself, therefore staying centered. A form of meditation, sketching is a fabulous way to stay in the present moment as it requires all of my attention. As my mind travels, my pen follows. My sketchbook is one way I connect with myself and the world around me. Drawing keeps me on track, both in my creative work and in my life. There is no separation. Accessing deeper meaning doesn't have to be something that happens only in specials places or at special times. It's available to us 24/7 in all of our choices. 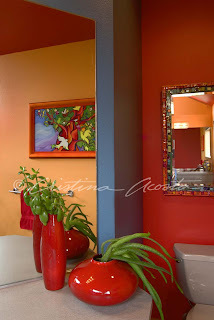 I recently wrote a blog entry titled Authentic Color Vs. Color Trends that explores using the process of choosing colors for your home as a self-development practice. Because we are creators, being connected is crucial. The fossil fueled motor and this boon (along with other factors) has led to global climate change, possibly humankind's biggest global challenge. At this time in history it is especially important that each of us are aware of our part in creating our small piece of the world and how those pieces interconnect with others. Can Color Change Your Mood? Feel like no matter what goes on around you, even if you're not in control you at least know what's going on? Well, you do and you don't. The senses we rely on to understand the world around us aren't always accurate. Shapes and colors manipulate how you perceive the world around you -- along with texture, temperature, scent, sound and more. 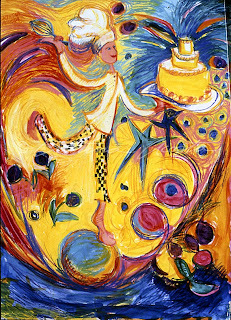 Think about bright colors and food. Vitamin rich fruits and vegetables are mostly colorful. Fast food restaurants don't serve colorful fruits and vegetables, so instead they put strong colors in the decor of the restaurant, the pictures on the menu and the packaging. Candy is almost always manipulated to be artificially brightly colored to appeal to the human impulse to eat brightly colored healthy food. As obvious as the manipulation of food colors are, colors in our homes and business offices manipulate where our attention goes as we move through the space and how we feel about the space. A red door on a brown house focuses our attention on the door. But don't feel that colors have one note, like the keys on a piano. Though many studies of colors have outcomes that insist yellow is happy or red is stimulating, those studies can only address that color in one environment. 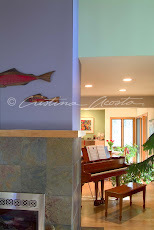 Colors interact with each other to create a melody line, just as the keys of the piano can combine to create a tune. The bottom line is yes, color affects your mood. But don't get caught up in creating a rigid identity for every hue. The interaction of a color with other colors and the cultural viewpoint(s) of the people experiencing the colors is the ultimate arbitrator. Assigning one emotional response to a color is like insisting that each note of the musical scale has an immutable meaning. Like insisting that the note of middle C is always happy and F minor is always sad. Pay attention to the interaction of colors and strive to be aware of the meanings you've assigned to colors and you will begin to use colors more creatively in all aspects of your life. I love to cook for my family and friends! Initially I was inspired by my grandmother's artistry with a variety of ingredients and my mother's love of experimentation when she baked. As the oldest child of seven children, I did quite a bit of cooking for the family. Encouraged by my success (if my teenage brothers didn't eat it, the dogs would), I was continually trying new recipes. Now, I'm married to a lovely man who eats most anything I make, and encourages me to cook every day (Hmm... what's up with the everyday thing?). He loves food and has an adventurous palette. (And he often does the dishes!) With his encouragement I'm continually trying new things. Yield: 6 to 16 pieces, depending on size cut. ½ cup 100% unsweetened key lime juice, OR organic 100% lime juice, not from concentrate. With a blender, food processor or by hand, cut the butter into the dry mixture until the butter is in very small pieces and the mixture has a crumb like appearance. Reserve ½ cup of the mixture for topping. Pour it onto the cooked base. Sprinkle the topping evenly across the filling. Return the pan to the oven and bake for an additional 15 minutes. Serve the Key Lime Custard Squares at room temperature or chilled. Cut into servings after it has cooled. Refrigerate for ease of cutting into small squares or to transport (makes the dessert firmer). My garden offers shelter to quail, rabbits, skunks and deer that wander through our 1/2 acre of Manzanita, Bitterbrush and Ponderosa pine near the city of Bend, Oregon. I've put out mineral salt licks, bird feeders and water features to support the wildlife. As you can imagine, I don't have much in the way of animal proof flora. What one animal doesn't eat, another one does. Mint and Shasta daisies resurface annually as none of the animals like them (except us -- we get great tea from our mint). It's ok with me -- I love watching the animals at the feeders and feel connected to supporting their presence in the continually developed surrounding lands. Decorating my garden with art that can make it through the Bend, Oregon winters is tough. Metal and concrete make it through the extreme weather, so I use them to adorn the garden. During my trip to Oaxaca last February I found a small store that sold recycled aluminum recast into garden pieces. Made in Northern Mexico, the large pieces are light enough (compared to cast iron) to make it back home in my suitcase. I bought this 20" high aluminum cast Guadalupe. When I got home I primed the piece with spray paint, then painted it in oils. 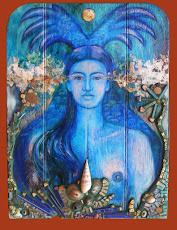 My friend, Terry Scoville, an artisan woodworker mounted it on vintage panels she shaped and cut. 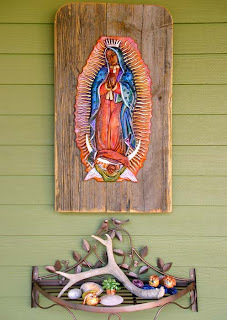 My husband just hung the Madonna on the side of the house near the entrance to my studio and I adorned it with a shed horn and seashells I found along with some clay pieces my daughter made. My painted cast metal Guadalupe is a Retablo, presented on the wood panel in the Hispanic tradition of sacred art known as a Santos. 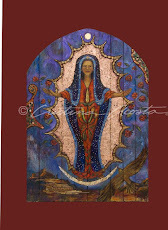 See other examples of my ex-voto and santos style retablos on my website.